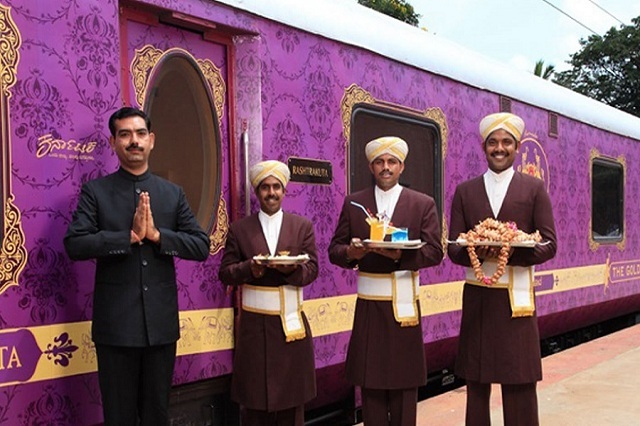 Indian luxury train Golden Chariot soon to re-launch the Southern Splendor Tour. In a recent event of the inauguration of three-day “India International Travel Mart – 2018” in Bengaluru, Tourism Minister Sa Ra Mahesh announced that the luxury train will restart its Southern India bound itinerary. The service was discontinued for two years and plans to restart were made after Indian Railways recently revised the haulage charges. Golden Chariot, run by Karnataka State Tourism Development Corporation (KSTDC) reported to have suffered a loss of INR 40 crore last year due to the fall in the number of visitors and high haulage charges. But now reports reveal the train to have earned a profit of INR 12 lakh in last fiscal season.The luxury train has made a number of refurbishments to both its coaches, packages and routes. Southern Splendour train tour by Golden Chariot covers the states of Karnataka, Tamil Nadu, Kerala and Puducherry in a 7 nights/ 8 Day itinerary. Covering UNESCO World Heritage Sites, historic monuments, ancient tempels, natural beauty, and cherished experiences, the train itinerary is crafted to provide memories of a lifetime. As a part of a special plan the Karnataka Tourism department was also preparing a booklet and map of all waterfalls in the state in addition to improving tourist facilities at all these sites. The Tourism Minster also announced, “The monsoon this year was good, therefore waterfalls will be absolutely beautiful which will increase the footfall of waterfalls”. The waterfalls spread all over Karnataka being listed, documented and new itineraries being prepared are an initiative to make the most of the opportunity. The launch of the itinerary will lure crowds interested in exploring the Southern states of India.